This is the most recent album of a rather obscure metal band who released their incredible debut, Irae Melanox, in 1988. The band disbanded after this, and reformed after the turn of the century to record three more full length albums. After Opus was finished, they disbanded, leaving this as their final musical statement. For those of you familiar with Adramelch, you know that their debut album was a stellar example of progressive power metal in every sense. If you came here expecting the same, you will possibly be disappointed. I say this because this album is different, but not because it isn’t good. In fact, I found listening to this album to be quite the enjoyable experience, but the fact of the matter is that this album is a clear departure from their metal roots as they have morphed into a melodic and progressive hybrid of power metal and progressive rock. There was a certain eerie and enchanting charm that they once had that is conspicuously missing here. Having said that, this album is strong musically and once you accept that it is merely different, it still has a lot of good to offer. The album’s overall sound is reminiscent of late-era Dream Theater, with all their finely crafted chord progressions and melodies, but lighter in execution. The usage of synths is far more prominent. The vocals are more polished and precise. The production in general is an order of magnitude cleaner. What is similar are the finely crafted vocal melodies and the haunting lead guitar parts. They seem to have kept their overall style of composition, but have cleaned up the final product a good bit. And instead of riffs driving each song, most of the time the riffs are played over a foundation of chords, which contribute to the more progressive rock feel that this album has. But these aren’t just your typical I-IV-V rock chord progressions. There was some serious thought put into them, and the beautiful interplay between the chord progressions, the lead riffs, the bass lines, and the vocal melodies and harmonies work to create an astonishingly solid sound. 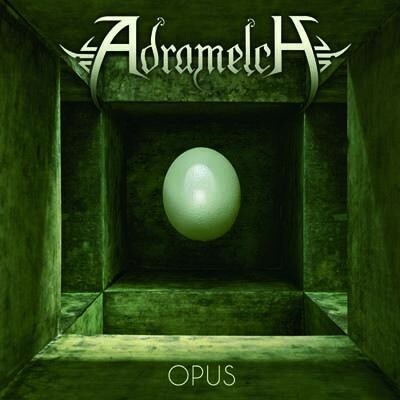 You can hear this throughout the album, but songs like “Northern Lights” and “Forgotten Words” are excellent examples of Adramelch’s compositional prowess. And the tail end of “As the Shadows Fall” showcases their contrapuntal mastery at a very high level. The tone of the album is a plodding melancholy one with brief glimpses of hope scattered throughout. And it is these changes back and forth from despair to triumph that create the tension that make the album so engaging as a musical piece. I have always liked progressive rock, so there is likely some bias showing through here, but I didn’t walk away from this album disappointed at all. But you might, especially if you are expecting the sequel to Irae Melanox. And even though I fully recognise that Adramelch have changed their sound, they haven’t lost the skills in composition that helped make their previous efforts so strong. Power metal and progressive rock fans will find plenty here to enjoy. Metal purists should probably look elsewhere.